A series of different explosive media, homogeneous or heterogeneous, was selected to examine the influences on detonation propagation in two-dimensional explosive slab bounded by a layer of inert gas with the same thermodynamic properties as reactive media. The explosive system studied is an ideal gas with a single exothermic reaction governed by a pressure-dependent reaction rate (pk) with a pressure exponent of k = 3. The heterogeneity of explosive media is imposed via a series of sinusoidal ripples in density with different wavelengths while maintaining constant pressure. The numerical simulations are initialized with a ZND solution for the ideal CJ detonation, and the detonation is allowed to propagate into the explosive layer. 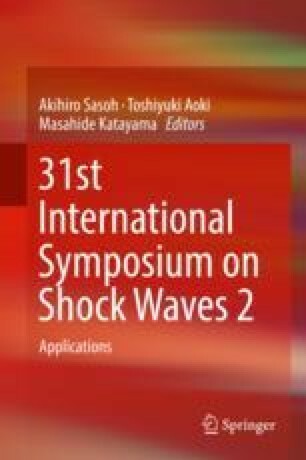 The results showed that the detonation in the heterogeneous medium exhibits a three-wave structure of complex shock interactions. The detonation is able to propagate into a significantly thinner layer of explosive and can exhibit a greater velocity than the corresponding homogeneous case. Also, the detonation velocity is higher during propagating in the more heterogeneous explosive medium, and the critical thickness of explosive layer that detonation can successfully propagate is also thinner in the more heterogeneous explosive medium. This work was supported by the National Natural Science Foundation of China (No. 11572258, No. 91441201), NASF(No.U1730134), the Science Challenge Project (No. TZ2016001), the opening project of State Key Laboratory of Explosion Science and Technology (Beijing Institute of Technology)(No. KFJJ17-04M), and the Fundamental Research Funds for the Central Universities (No. 3102017Ax006).